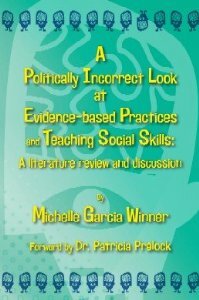 A Politically Incorrect Look at Evidence-based Practices and Teaching Social Skills: A Literature review and discussion by Michelle Garcia Winner. The author argues effectively for an important and more thoughtful alternative to behaviorally-based social skill `training’ approaches, which are so limited in honoring the complexity of individuals with ASD. Pp. 128. This entry was posted in Our Library, Social Skills and tagged ASD, Autism Spectrum Disorder, books, Michelle Garcia Winner, social skills. Bookmark the permalink.